WEST LAFAYETTE, Ind. - Carsen Edwards scored 23 points on 8-for-22 shooting, and No. 24 Purdue pulled away from Ball State for an 84-75 victory on Saturday night. WEST LAFAYETTE, Ind. - One big second-half push by Purdue was enough. 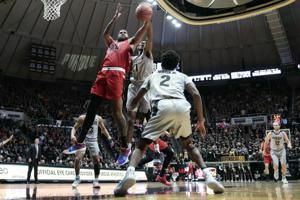 Carsen Edwards scored 23 points on 8-for-22 shooting, and the 24th-ranked Boilermakers pulled away from Ball State for an 84-75 victory on Saturday night. Edwards struggled with his shooting stroke at times but managed to contribute in a variety of ways. The junior guard had five rebounds, five assists and blocked a shot. Purdue trailed 48-45 after Kyle Mallers made a 3-pointer for Ball State with 18 minutes left. But the Boilermakers responded with a 24-4 run.